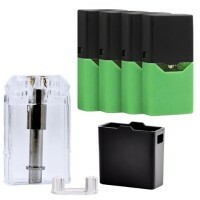 Ovns JC01 Juul Compatible Battery. Colors May Vary. 1ct. Dimension: 65.5mm x 40mm x 8mm Resi..
Sea 100 - Juul Compatible Pods. 5% Nicotine. 4 Pods In A Pack. 1 Seapod contains: 1.0 ml with 5% .. Relax Juul Compatible 1000mg CBD Pods. 1ct. .. Puff Elite Juul Compatible Pod Battery. Colors May Vary. 1ct. Includes: Rechargeable Device..
Sea Juul Compatible Pods Battery Device. Color May Vary. 1ct. 1 Rechargeable Device 1 USB Ch.. Puff nic salt - Juul Compatible Pods 4pk. Each pack has 4 pods which are 5% strength each. ..
Ziiplab Zpods Juul Compatible Pods. 5% Nicotine. 4 Pods In A Pack. 1 ZPod contains: 1ml 1 Pod is..
Ovns JC01 Juul Compatible Mini Pod System. Colors May Vary. 1ct. Dimension: 65.5mm x 40mm x 8m.. WARNING: -This product can expose you to nicotine, which is known to the State of California to caus..
Ziiplab Zpen Disposable Vape Pen - Strawberry Milk. 1ct. ZPEN DISPOSABLE 5% SALT NICOTINE 1.3ml ..